The Moxy Hotel Boston is a 24-story hotel located in Downtown Boston's Theater District featuring 346 "micro" guest rooms. Each room at the Moxy Hotel will be approximately 175 square feet in size. Amenities will include a rooftop bar and lounge as well as meeting rooms, a kitchen and dining area and a fitness center. A two-story advertising sign will be constructed at the corner of Stuart and Tremont Streets as part of the Moxy Hotel's facade. No new parking will be constructed on the Moxy Hotel site; parking demand will be satisfied by existing neighboring garages. The Moxy Hotel is expected to open in June 2019. The glass and metal curtain wall facade for the Moxy Boston is in place as crews work to wrap up interior finishing for the expected opening in June of this year. The 143,000 square foot project will feature 346 micro guest rooms along with a rooftop bar and lounge, fitness center and meeting rooms. While the rooms are designed with a small footprint they still feature high-end finishes and edgy graphics to convey a theatre theme to match the location amidst Boston's Theatre District. 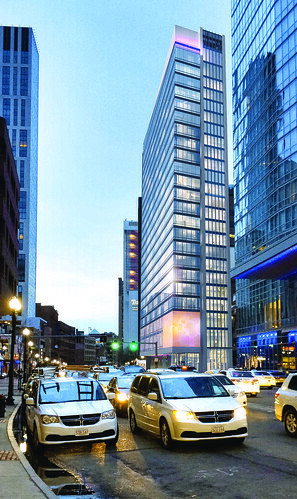 The glass facade is nearly complete for the 24-story Moxy Hotel in Boston's Theater District. Space is left for the two-story digital ad sign to be installed at the corner of Stuart & Tremont Streets. On the back side of the project, colorful panel install is beginning. The tall skinny tower will feature 346 micro guest rooms, each coming in at around 175 square feet. The hotel will offer a rooftop bar, fitness center, and meeting rooms. Construction is scheduled to be complete in June of this year. As framing is nearly complete for the upcoming 24-story Moxy Hotel, glass facade work is also well underway. The new hotel, located in Boston's Theater District will feature 346 micro guest rooms, each just around 175 sf. Guests of the hotel will have access to a rooftop bar as well as meeting rooms, and a fitness center. The hotel is expected to open in June 2019. Construction continues at the Moxy Hotel.at 240 Tremont Street in Boston's Theater District. The 24-story concrete superstructure of the upcoming Moxy Hotel tower at the corner of Stuart and Tremont Streets in the Theater District will begin its’ rise into the Boston skyline in the coming weeks, with the project’s tower crane now in place. The crane will be used to support the superstructure’s construction, and will stand within the tower’s footprint in order to make optimal use of the small downtown project site, where space is limited. Preparations are now underway at the Moxy Hotel site in Downtown Crossing to start construction of the upcoming 24-story Moxy Hotel tower. Construction is expected to start in earnest in Spring 2017. New renderings of the tower have been released; these renderings are posted above. Expected completion of the Moxy Hotel is in late 2018. Lee Kennedy Company is the project's general contractor. Per an Environmental Notification Form (ENF) submitted to the Executive Office of Energy and Environmental Affairs, the Moxy Hotel at 240 Tremont Street in Downtown Crossing will break ground in December 2016 with estimated completion in Late 2018; the following is a link to the ENF. Norwich Partners, developer of the Envoy Hotel, will take over the approved project from Abbott Development; the Boston Planning & Development Agency (BPDA) will grant Norwich Partners a long-term lease of the 0.13-acre BPDA-owned project site. Abbott Development received approval from the BPDA in July 2015 to construct the 23-story, 346-room Moxy Hotel; the Moxy Hotel is already listed on Norwich Partners’ website. General Contractor Lee Kennedy Company, who also built the Envoy Hotel, will construct the Moxy Hotel. Additional information about the Moxy Hotel can be found above.